Making simple loops is one of the keys to the art of jewellery making. They can be used in earrings, pendants and bracelets and are one of the basic building blocks of jewellery creation. There are several different ways of making a simple loop, but the method detailed below is the one I find simplest and easiest. Place the top of the wire or head pin in the jaws of the pliers with the top of the wire flush with the top of the jaws. 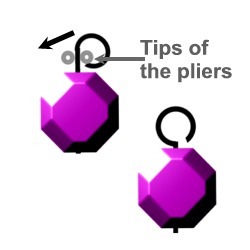 The size of the loop depends on where about in the pliers you place the wire. For a small loop place the wire in the tip of the jaws, for a larger loop place it further up the jaws near the handle. 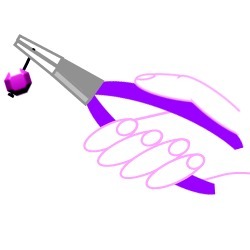 Hold the wire or headpin in your other hand and turn your ‘plier’ hand towards you to make a small loop at the top of the wire. 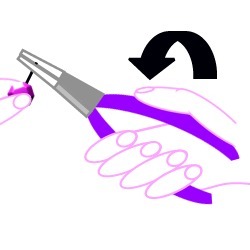 If the loop isn’t straight, straighten it by placing the tip of your pliers in the loop, on the side of the wire away from the opening, grip the wire and bend the loop backwards to straighten it.